“Violent behavior in young men appears to be linked to an imbalance in the relationship of copper and zinc.” William Walsh, Ph.D.
Copper is an essential trace (See Alfalfa Protocol) mineral essential for human health. It is also one of the most important blood antioxidants. A copper deficiency causes higher serum cholesterol levels along with the lesions similar to those seen in coronary artery disease (See Arterial Plaque Protocol). Its deficiency is associated with increased levels of fat in the blood and heart muscle degeneration. Please stay away from HFCS as fructose depletes copper. I have long operated on the premise that Oxygen, Garlic et al, Copper and blood cleansing are essential for cleaning up my blood. Copper is found in a wide variety of foods and is most plentiful in organ meats, shellfish, cocoa, molasses, nuts, and seeds. Since I eat a LOT of these I have little problem obtaining copper. My problem is all this copper often drives out my zinc and I must assure zinc by supplementing often. Copper appears to be a difficult mineral to deal with. The daily required value for copper is 2 mg. At about 8 mg per day copper starts to get dangerous. This is one reason your water filtration system (See Water Protocol) MUST remove most of the copper. Ten glasses per day of water with the EPA allowed copper limit ALONE will give you over 3 mg of copper. Be sure to chelate (See Chelation Protocol) excess copper. Some experts believe that elevated copper levels, especially when zinc levels are also low, may be a contributing factor in many problems including schizophrenia, hypertension, stuttering, autism, fatigue, muscle and joint pain, headaches, childhood hyperactivity, depression, insomnia, senility, and premenstrual syndrome. Citrus foods increase the absorption of copper. IMO you need to get your copper from food sources. Chicken liver (See Animal Liver Protocol) is a great source of balanced zinc and Copper. 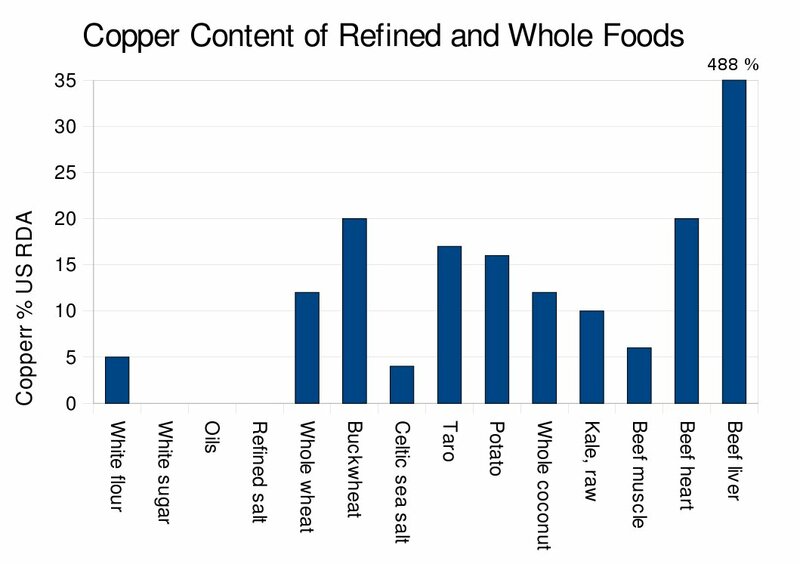 Here are the food sources highest in copper. Copper and Zinc (See Zinc Protocol) may interfere with each other when eaten at the same time and over time if the ratio is wrong. For example if you eat more than a little beef liver you will need to get more zinc in your diet, as the ratio of copper to zinc is way wrong. The ideal ratio is ten zinc for each copper (10.0). In beef liver the ratio is about three COPPER for each zinc. OTOH if you are low in copper it’s the way to go. Foods with low ratios of Zinc to Copper; 10 Zinc for each Copper is ideal (10.0) too much of these foods may cause you to have low Zinc. Note some foods are high in Zinc in relation to Copper ratios and may also cause low copper. Just be aware of a possible problem with copper and zinc. I usually eat a LOT of these high copper foods, take supplemental Zinc (See Zinc Protocol) and chelate (See Chelation Protocol) free copper. To reduce high copper levels, you must use significant amounts of vitamin C and zinc and assure good cholesterol levels. "Life Extension does not recommend high dose high dose copper as a long term dietary supplement because the preponderance of evidence that long term supplementation can generate too much free radical activity throughout the body. on the other short term supplementation of copper (8 mg daily) to enhance wound healing at localized injury sites is appropriate. Copper supplementation as early as possible as serious burns has been demonstrated to replenish the copper depletion that is so typical of burn victims." Excess Copper can generate a lot of free radicals which harm your body and you only want to supplement to correct a short time problem. What I do is try to keep a good copper level and support the proper copper to zinc ratio is by eating the appropriate FOODS. Make sure you take supplemental zinc if you eat a lot of these. I eat a LOT of many things on this list; you can see why I MUST take a LOT of supplemental zinc. This ratio should be about 10.0 on a long term basis. Note strangely I eat a lot of these everything on this list but the potato skins and tap water.